Drowsy Driving Prevention Week is scheduled in November. The National Safety Foundation sponsors it and the organization provides information at https://sleepfoundation.org/drowsy-driving. 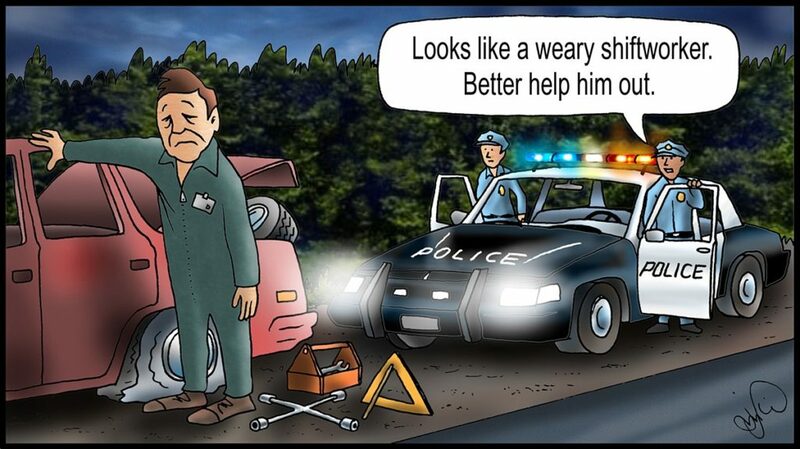 How many of us drive when drowsy? According to the American Sleep Foundation, about half of U.S. adult drivers admit to regularly getting behind the wheel while feeling drowsy. About 20% admit to falling asleep behind the wheel in the past year, with more than 40% admitting to falling asleep at least once in their driving careers. I am part of that 40%. Are you? Mike Grover of Plains Midstream Canada will wonder about Canadian statistics. In a 2007 survey, about 60% of Canadian drivers admitted that they occasionally drove while fatigued. 15% admitted that they had fallen asleep while driving. The Canadian Automobile Association says that drowsy driving causes 20% of accidents in Canada. Let’s say I am working night shifts in a Houston control room beginning at 6 pm. I have a 60-minute commute, so I get up at 4pm. When I get off at 6am, I have not slept for 16 hours and now have to navigate heavy traffic for 60 minutes. If I work four night shifts in a row and only sleep the five to six hours most get when working night shifts, what are the chances that I am driving drowsy after any of those shifts? A study by Boston hospital researchers revealed just how dangerous shift work can be. Sixteen night shift workers were asked to participate in two driving sessions on a closed driving track: the first after sleeping for the night, the second after completing a shift at work. Researchers measured drowsiness with an EEG during micro-sleep episodes. Driver performance was determined through near crash events, sessions that were stopped for failure to maintain control of the vehicle, and lane departures. 37.5% of the drivers in the session after working the night shift were involved in a near crash event. Over one third of the post night shift sessions ended when emergency braking was required. Half of all sessions ended early when drivers lost control of the vehicle. Researchers were able to identify sleep-related impairment within the first 15 minutes of driving. What can be done to reduce the risks from drowsy driving? It does little good to advise avoiding driving after a night shift. People want to get home. I guess one solution would be to live as close as possible to work. Another might be to car pool if there is a coworker who works the same shift rotation. I suppose a drink with caffeine a couple of hours before the end of shift might increase alertness for the drive home. If you are really sleepy at the end of a shift, take a 15-20 minute nap before driving home. This is a difficult subject. People need to be alert enough to get home, but not so alert they cannot get to sleep when they get home. All of us need to ensure that we are getting medical assistance for any sleep problems that hinder our ability to sleep. We are more likely to avoid drowsy driving if we are able to sleep well when we do have sleep opportunities. I wish there were great solutions to prevent drowsy driving, but it is part of the modern, 24-hour world we inhabit. We work and drive at times when it would be better to be asleep. MANAGING FATIGUE EDUCATIONAL PROGRAM | Charles Alday © 2018 Please Distribute to Others. Download this blog as a PDF. Download this blog as a Word Doc.